Siddhi Ganesh Saving & Credit Co-Operative Society Limited was established in chorcha Tole, Bhaktapur Municipality-6, Bhaktapur and registered under the Co-operative Act 1991 at district Co-operative office with aim to create the saving habit to meet the credit access for the up-liftmen of the socio-economic lives of the community people. It was founded by thirty-one youth people in 1993 with the inspiration of community youth group discussion. Siddhi Ganesh SACCOS is a community based financial institution based on credit union operative principles. It is an autonomous organization registered under the co-operative Act. It is owned and controlled by its individual members. Thus, it is a non-governmental organization. It is committed to provide compatible products and services to its member at competitive price. It works to mobilize, co-ordinate and integrate the human and financial resources for the benefit of its members. The present jurisdiction of this SACCOS is the whole of Bhaktapur District. 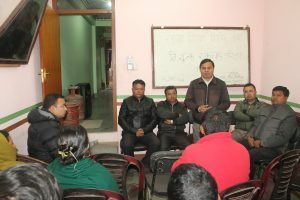 With a belief of solving financial problems by reducing unnecessary expense, 31 youths, who are dedicated to serve, gathered together and established Siddhi Ganesh Saving and credit cooperative society in 1993.From establishment, it has been going ahead as a preliminary cooperative following the cooperative values and principles. With collective leadership, we are making efforts to develop this community based SACCOS as 'First Choice of members' complete financial solution' providing with complete security for member saving and over coming the competition placed ahead by other financial institutions. The true introduction of this SACCOS is honesty and transparency of leadership and self-confidence and pride of members towards it. To improve its primary business saving and credit as well as other development activities, we always expect supports and suggestions from different sector of the society. Siddhi Ganesh SACCOS, established by 31 youth with a strong feeling of a mutual help has been going a long way respecting co-operative value ‘Mass Participation’. Presently it has a big family of 13774 members and recently going to introduce clusterwise AGM and ten is to one representative AGM so as to materialize member democratic control over the management of the SACCOS. To develop SACCOS in Nepal in the modality of Thailand , South Korea , Indonesia etc., the provision of representative AGM is a must.It will surely enable Nepali SACCOS to be No. 1 financial institution in the community as we believe in ‘More members more capacity’, Siddhi Ganesh SACCOS, which has gained a competitive position in the market, applies PEARLS Monitoring System to ensure the members full security of their savings. We are greateful to our well-wishers and friends for their cooperation and Hope, their feedback in future.